Large First floor studio apartment on private complex, boasting 2 communal pools & play area. Costa Antigua has several Bars/Restaurants within close proximity to the complex. It is a relaxed resort only 10 minutes from the airport. A satellite resort of Caleta de Fuste, which is only a 20 minute stroll along the seafront, where you can feed the friendly chipmunks or try fishing, or a 5 minute drive by road. Caleta is a busy resort for families & couples that has several man made sandy beaches with sunbeds, parasols and provides safe swimming along with a multitude of water sports. The resort has numerous bars and restaurants that provide a variety of cuisines and compliment the relaxed atmosphere of the resort. A further 5 mins drive are two 18 hole golf courses. The apartment is well located to use as a base to visit the rest of the attractions the island has to offer, such as the Jandia beaches, Oasis Park zoo and botanical gardens, the sand dunes of Correlajo and Baku water park. I live in Ireland with my husband, 2 sons and our 3 year old dog and fish. My husband and I both work, but spend our holidays in Fuerteventura, where we have made many friends and have really fallen in love with the area. Absolutely fabulous weather, a great place to relax and chill out. Fantastic beaches and plenty of them. Great watersports, wide variety for restaurants, entertainment for all. Completely family orientated. We love it. Spacious Bathroom with bath/shower and wc. Open-plan living/dining/kitchen area. Sofa, dining table, TV & DVD, english tv channels, wifi, patio doors onto large, safe balcony/patio with sea views. Fridge freezer, 2 ring hob, microwave, toaster, kettle and washing machine etc. Less than a 5 min drive away or taxi is the two fantastic 18 hole golf courses, and a driving range. The first was home to the Spanish 'Open', April 2004, a great many complimentary remarks were made about the course and the playing conditions. An 18 hole, par 71, distance 6124m, with a 50 bay driving range and 2 practice greens. The 365 day a year course is comfortable to play, even in the middle of the day due to the constant cooling breeze. A meandering stream feeds 3 large lakes and the course is planted with mature palms and attractive cactus and sub tropical gardens. The golf club is situated in the 5* Elba Palace Golf Hotel and offers a very fine 19th hole for relaxation. The hotel boasts a very good restaurant for fine dining. The second course has only just opened and includes a driving range, both within a 5 min drive. There is a courtesy bus that picks up that takes you directly there. Club, cart and trolley hire also lessons are available. 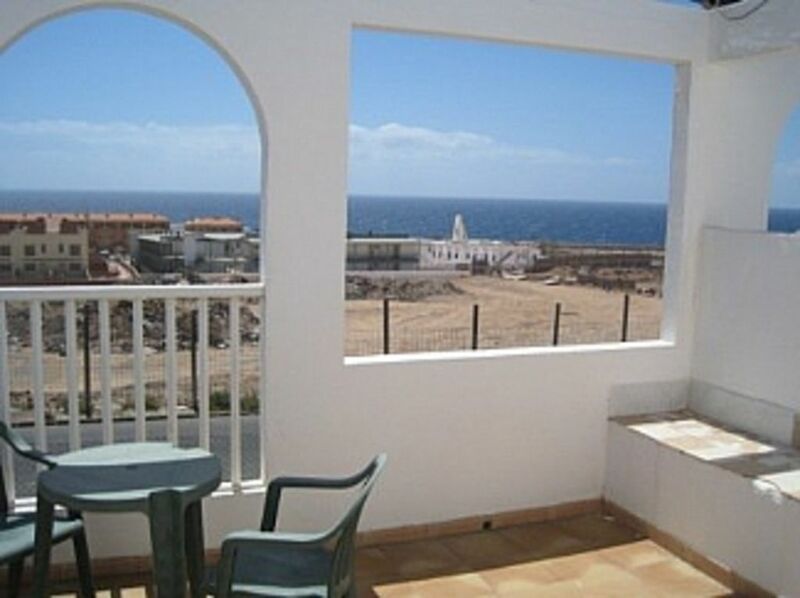 Outside: Large sea view balcony/patio area with table, chairs & sun lounger and sturdy railings over 1.5 metres high. Gardens around the whole complex with trees, rose bushes, plants etc. 2 communal pools, one shallow suitable for small children & adults alike. Gates to the complex are locked with access to & from the complex with your own key. Cleaning / Towels / Linen / Maid service: All towels and linen included. Studio with nice sunny balcony and everything you could need. Will be back again. As previous reviews have said, the communication appears to be quite poor between the owner and the person supposedly holding the key to the property. When we arrived 'Lynne' was nowhere to be found. Thankfully there were some guests leaving the complex who had a number for a fella called 'John' who kindly came and collected us and let us into the apartment. The studio itself was clean and had everything you could want for our stay including a washing machine and travel cot!! a must for us!! if not a little on the small side. The complex itself was mainly British folk who had bought out there, all very friendly and happy to have a chat. There are a few bars and a Chinese restaurant (the best on the island apparently) outside the complex and a good size supermarket. Otherwise the beach and town of Caleta De Fuste is a good 30/35 minute walk. So make sure you take a good pair of shoes, you can get a taxi across which will cost around 3 to 4 euros. The apartment is very close to the airport approx 10 mins by car. There is a chap who lives on the complex that is more than happy to take you back for 10 euros. Over all we had a really relaxing stay, however if your looking for some good nightlife and entertainment and a beach on the doorstep this is not the place for you. The apartment itself was fine. Clean, good location and facilities. Alas the communication was nothing short of shambolic. Unfortunately for us, that person (not the owner, the "responsible" individual on site) decided going out was a better use of their evening! It took some calls and time to finally get the keys (from another resident who assisted as clearly someone was having too good an evening), just what you want at that time. The process of leaving was equally shambolic. I advised we had an evening flight do would be departing late afternoon. Come the final day I get a text advising we need to be out inside 30 mins! Suffice to say I was unimpressed and agreed to leave at lunchtime. If you are looking for an apartment, this is a lovely location, and this is a clean and tidy place, but good luck getting the key when you arrive! Because of this I cannot recommend. Perfect for cyclists, cross the quite road from the complex and you are at the coastline, there is a cycle track and footpath which links up 3 resorts. Fishing is very popular off the coast 2 mins from the complex. There is also a diving center in Caleta and a windsurfing school, horse riding in Triquivijecy. Fuerteventura has 150 beaches. Costa Antigua is situated on the coast just a 20 minute stroll along a paved coastal walkway to the safe beaches of Caleta de Fuste, which caters for sunbathers and the more adventurous with a multitude of water sports and activities. Free bus to and from the beach from the nearby bus stop. This bus also takes you to the Atlandico centre, an air-conditioned shopping centre, cinema, bowling alley and many restaurants, bars Burger King and large supermarket. The islands airport Puerto del Rosario, now linked to numerous airports in Ireland & England including Dublin, Shannon, Cork, Leeds/Bradford (Ryanair), Liverpool (Easy Jet) is just a 10 min drive away. Private airport pick-ups & drop-offs are available (payable in resort). Although a car is not essential it is recommended for the less mobile and allows the opportunity to visit various places of interest and some of the other magnificent beaches the island has to offer. Costa Antigua is ideally situated to visit any part of the island within 1 hour by car with the vast sand dunes of Corralejo to the north & the golden sandy beaches of Morra Jable to the south. Both have numerous activities including windsurfing, jet skiing & surf boarding. The islands capital Puerto del Rosario is just a 15 minute bus journey away. Fuerteventura has a wonderful zoo, which provides a courtesy bus, with daily pick-up. Fancy going to Lanzarote for a day -ferry trip available. There are a couple of small supermarkets and bars/restaurants in Costa Antigua with live entertainment with singers, acts & even bingo for those who like a flutter, although near-by Caleta de Fuste offers a much wider choice. There is a free bus service to the larger shopping mall in the Atlantico Centre offering a larger supermarket, numerous bars/restaurants, bowling and cinema complex and other shopping outlets that cater for all. There are several banks & cash machines for that all important currency. Caleta de Fuste has a multitude of good restaurants that can cater for all tastes at very reasonable prices. Booking Notes: 50% deposit must be paid in advance and the balance can be made upon arrival in resort. A booking form attainable from myself is required to be filled in before bookings can be confirmed. Changeover Day: Please contact owner.